Our award for the most intelligent, creative, and fun idea goes to Ojamas Sleepwear. Which came first, the name or the product design? The Michigan company playfully conjured up the idea by thinking of words real and imagined that rhymed with Obama. 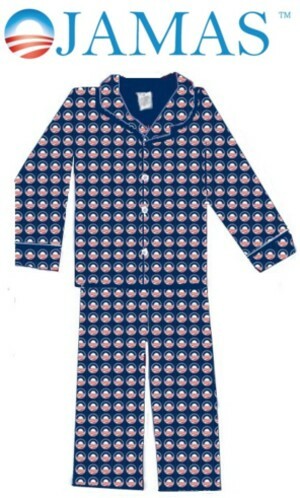 Pajama was one of the first words that came to mind and the contraction was an immediate and obvious winner. They considered several design ideas, and settled on the “all-over O” in a staggered step-and-repeat pattern which has drawn praise from as far away as Australia where World News called them “the latest in political fashion chic.” Originally planned to ship world-wide in time for the Democratic National Convention, the factory hit a snag and the initial product varied too significantly from the original design specification. They were sent back to square one and are now planning to begin filling a backlog of orders by the second week of October, just in time for the presidential election. A portion of the proceeds from sales are to be donated to the Obama/Biden campaign. Well done, Ojamas. I’ll take five pairs. To order yours, visit www.Ojamas.us.